Artists who pick up a tube of Classico Oil Colors will find in it just what they need — the artist’s daily bread and butter. 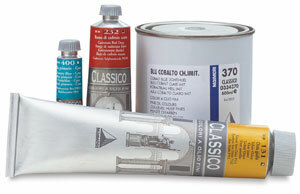 These oil colors are versatile, offering an unsurpassed price-to-quality ratio. Produced by strict principles that yield a top-quality product, they revolutionize the criteria by which an economical (rated “fine”) range is judged. They contain no waxes or thickeners, and no manufacturing shortcuts. The color palette includes the best original natural Earth and true Cadmium pigments. Average pigment concentration is very high, and the formulas have been perfected to balance the drying times of all colors. Bright, lively colors with overall harmony in the palette, Classico Oil Colors are made with modern, non-toxic, non-polluting pigments that improve lightfastness. All colors may be intermixed in any ratio or proportion, without limits. Thanks to Maimeri’s vast experience, Classico Oil Colors have become the daily workhorse of a whole generation of artists. Intro Set of 9 — The ultimate painting experience begins with this Classico starter set for those who want to get a larger sampling of Maimeri's Classico paints. Set contains 9 colors in 60 ml tubes, including Titanium White, Permanent Yellow Lemon, Yellow Ochre, Cadmium Red Medium, Burnt Sienna, Phthalo Green, Ultramarine Deep, Sky Blue, and Burnt Umber. Intro Set of 8 — This introductory set contains 8 colors in 20 ml tubes, including Titanium White, Primary Yellow, Yellow Ochre, Burnt Sienna, Ultramarine Light, Primary Blue - Cyan, Permanent Violet Blueish, and Ivory Black. Also included are a 75 ml glass bottle of oily thinner and a brush.